July 19, 2013 Dan Epp 0 Comments board games, family games, parker bros, table top games, WHOSIT? 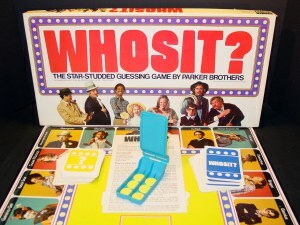 Released in 1976, WHOSIT? is a game where players begin by randomly taking one of 20 Character cards, keep it hidden from other players’ eyes, and then try to guess who has which card based upon the questions they draw from the Question Card deck. Players answer YES or NO depending on the question, such as, “Are you holding something?”, “Do you have glasses?”, “Are you male?”, or “Do you smoke?“ Lucky players can draw a “Ask ANY Question” card, which contains all the questions in the deck on one card.